Are you wondering the types of people you’ll meet in Prescott, Arizona? Interested to know who your future neighbors might be? Here’s one inspiring article written by Max Efrain from the Daily Courier of a Prescott business owner passing on his legacy and business title to a Prescott friend. “It only cost Lisa Dale $10 to buy her first business. Charlie Greenfield, previous owner of CJ Emporium and Barbershop, was looking to retire this last spring. Dale, his friend and employee for nine years, wanted to stay in the game; so he sold it to her for $11, $1 for every year he had owned it. “And then he gave me $1 back,” Dale said. Greenfield, 73, first came out to the area to marry his 14-year-old girlfriend when he was 16-years-old. His wife has since passed. “It was the first girl he kissed and the last girl he kissed,” Dale said. The business, which sits sandwiched between Nick’s Feed Your Face sub shop and Thaifoon in Park Plaza located off of Goodwin Street, had been in Greenfield’s care since 2004. “I turned it from being a good old boys place to a more modern beauty/barber shop,” Greenfield said. When his wife passed last year, he took it as a sign to move on and officially retired May 8, 2015, ending a 54-year career as a barber. He has since sold his home in Prescott and moved back to Nebraska where he has brothers, sisters, nieces, nephews, children and grandchildren. 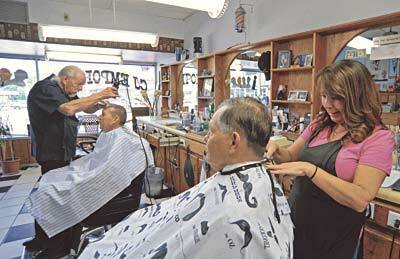 To fill the empty barber’s chair, Dale hired on James Smith, a 50-year veteran of the trade who was working at a shop in Prescott Valley. “Charlie told me to go find him [Smith] and hire him, and he came right over,” Dale said. “Well, I told her I wanted to get back into town,” Smith said. This is just one article that demonstrates the character and integrity of our Prescott business owners and creates a wonderful environment of growth and success. 7276 N Summit View Dr., Prescott Valley 86315 – SOLD!